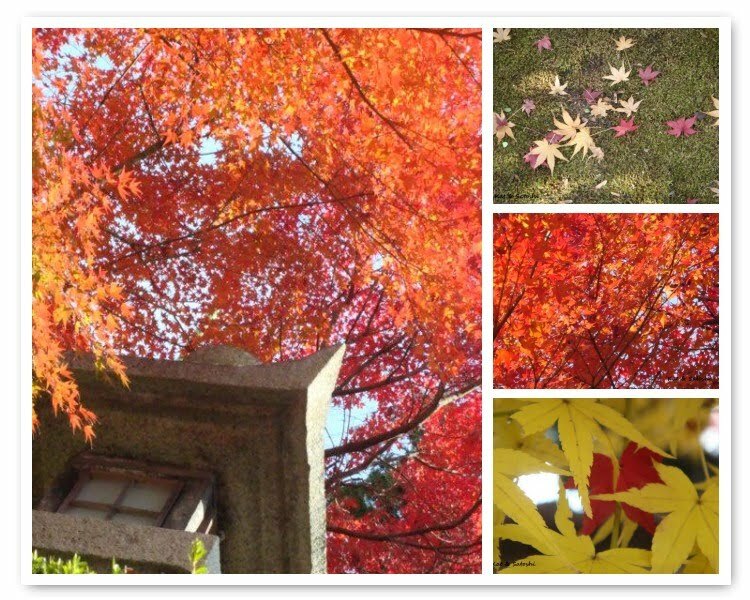 This year, we didn't get a chance to check out our favorite fall foliage spots, partly because of the weather, partly because of Satoshi's schedule. It is okay though, I think we still got to see a lot this year (well, I got to anyway), especially in the areas around us. 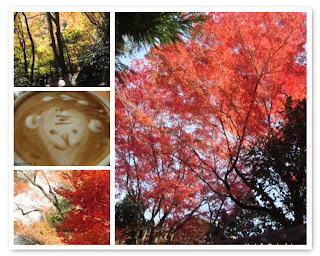 On the 23rd, we saw a couple of trees in Suigetsu Park. Then, a couple days later, on my walk from the supermarket, I saw this HUGE maple tree in someone's yard. It was "lit" up by the sun. An area in front of my student's house in Kawanishi. Not only were the maple trees beautiful, the ginko biloba trees were bright and yellow. I saw these in Honmachi the other day. Boba tea. I made my own with tapioca pearls and earl grey tea. I think I should have sweetened the tea a little more, still it was a delicious treat during the Summer. Next time I see tapioca pearls at the gourmet store, I should pick some up. Red Rooster Amber...meh, a bit on the watery side for me, I think I like their dark beer the best. 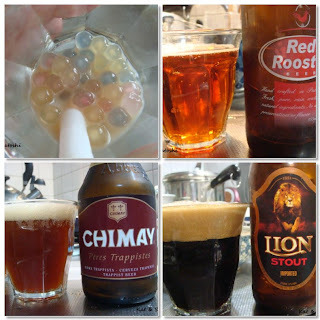 Chimay Red. This Belgian beer had a little bite to it, but we enjoyed this. Lion Stout. This Sri Lanka beer was smoky and easy to drink. I would get this one again. With my leftover roasted chicken breasts from Thanksgiving, I threw together Ellie Krieger's "Waldorf Chicken Wrap", from "So Easy". I didn't have the wrap breads that her recipe called for, so we had this with sesame rolls. Also, I didn't have walnuts and subbed pecans. This recipe also called for lettuce, but I didn't have any in the house, so left it out. This was delicious. Loved the crunch from the pecans and sweetness from the apples (I used Fuji). I put it together after Thanksgiving dinner and let it meld overnight. It was great for breakfast. I think the next time I make this, I may add some dried cranberries and some celery. Mix all together and serve with wrap/rolls. So, what did you do before your Thanksgiving dinner? I walked in to see the falls at Minoo Park. 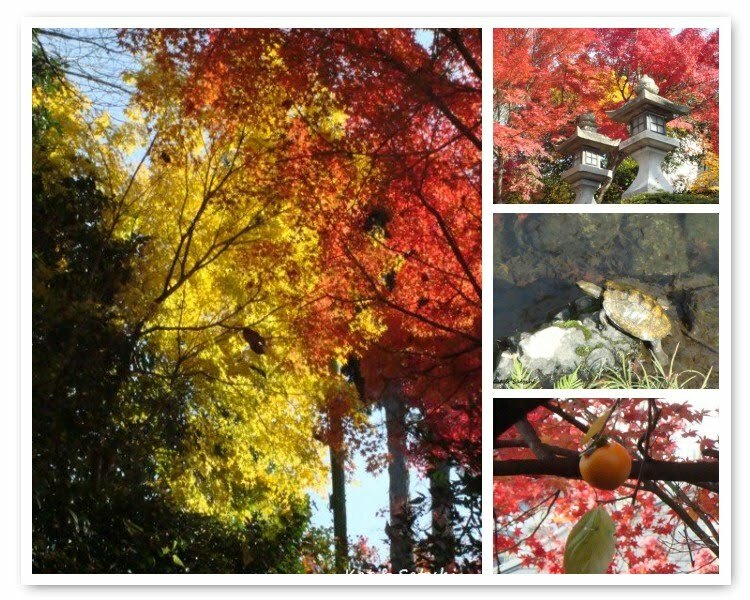 It was a beautiful, sunny day and since Satoshi has to work both days of the weekend, I decided to get out and see some Fall foliage. Starting a bit late in the morning, there were already many people there, actually there were many groups of people making the trek in. I think it is the only time of the year when the Hankyu Minoo line is really busy. I first stopped at Saikoji, this is where Satoshi and I checked out last weekend, it had gotten significantly more vibrant. Then I made my way to the falls, 2.8 kilometers one way, it was a great way to work up an appetite. The leaves were actually starting to dry up and most had fallen off the trees, but there were still some red, yellow and brownish red leaves here and there. After seeing the falls (which the leaves were actually kind of a disappointing brown-red), I made my way back out and had lunch at my favorite cafe, Per Caffe Bianco. I ended up having a big lunch...pumpkin soup, salad with marinated octopus, margarita (sp?) pizza and a cappuccino. Today's cappuccino art was a monkey. So cute. Everything was delicious and after all that walking, really hit the spot. After all that walking, I was kinda pooped and took my daily nap and then started my Thanksgiving cooking...what did you do before your Thanksgiving meal? Today is Friday, which means that "Thanksgiving" was yesterday and it wasn't a holiday here. In fact, most of Japan is already decorated for Christmas. I think it happened right after Halloween. Sometimes my family would go to the Big Island for the Thanksgiving weekend and I wouldn't be able to join them because I had to work the next day. I guess in a way, this was preparing me for my life here in Japan. Since I didn't go with them, I would get some take-out curry and that would be my Thanksgiving dinner. I've never seen turkey in the markets here, not even the processed kind. I think you can order it online, but with a teeny, tiny oven, who would be able to fit one in? So, this year, I decided to roast some chicken breasts and veggies (zucchini and eringi mushroom) simply with EVOO, salt and pepper, mash some potatoes with buttermilk, herbs (tarragon, rosemary and sage) and some butter and make this dessert. The recipe was from an early Christmas present to myself, "So Easy" by Ellie Krieger. There are some recipes that caught my eye, I hope to try them soon. In a pot heat up the milk, honey, vanilla, cinnamon, ginger, nutmeg & salt. Divide between 4-(7 ounce/200 ml) ramekins. Bake for 45 minutes, take off the foil for the last 10 minutes. NOTES: I made my pumpkin puree from scratch. I had some leftover pumpkin on the verge of getting moldy, cut it up and steamed it for 20 minutes. While it was still hot I scraped away the outer shell of the pumpkin. Then mashed it with a fork. The cooked rice I had was also leftover and it was a mixture of kodaimai and white rice. Kodaimai is the purple/black rice that I bought when we went to Lake Kawaguchi. The original recipe calls for 3/4 cup honey, but I thought that would make this a bit too sweet, plus the pumpkin I was using was a Japanese ebisu kabocha, which is pretty sweet on its own. Also, the original recipe calls for whipped cream as a garnish, but instead of going out to buy a carton of whipping cream, I just left it out. This was good. Since it wasn't too sweet, I would probably eat this for breakfast. So, this Thanksgiving wasn't spent with family. There wasn't turkey or Mom's pumpkin pie. The chicken skin came out crispy and the chicken very moist. Instead of gravy, I put a dollop of Mom's cranberry chutney. Even though I had dinner alone, I am thankful for my family and friends, our health, that Satoshi still has a job and that we always have (more than) enough to eat. Hope you had a Happy Thanksgiving everyone! Saturday night, I met Satoshi in Umeda for dinner after his German class. We had dinner at a wine bar called Luxe Tajimaya. Tajima-gyu is a brand name of beef, similar to Kobe beef. The restaurant is actually a lounge, so we started out with some wine and some amuse bouche. Amuse bouche, in Japanese is called tsukidashi, this is something that is automatically served and charged for, though no one orders it. The amuse bouche was a cold corn cream soup and spoonful of homemade beef tongue sausage. This sausage's flavor reminded me of the days when my mom used to make her own salami. Since we were hungry for dinner and this place was a lounge, we ordered some pupus (appetizers). Marinated olives. These were delicious. It was marinated in an agrodolce sauce (which I googled to mean sour-sweet in Italian). We loved the sour yet sweet flavor plus the saltiness from the olives and crunch from the walnuts. I gotta try to re-create this, it was so good! Bagna Cauda. True bagna cauda is an anchovy olive oil sauce, but this lounge uses dried beef as the base of their sauce. The flavor reminded me of sukiyaki or nikujaga because it was a little sweet, different but delicious with all the different veggies to dip. The filet steak was cooked medium rare and was so tender and juicy. Talk about melt in your mouth! We ate it by itself, then with a squeeze of kabosu (a type of lime) and with then with freshly grated wasabi. We were amazed that the freshly grated wasabi was not hot/spicy. Lastly we had a cheese plate. It came on a 2-tiered tray. There were so many different cheeses that I could only catch mimolette as one of the cheeses. For the two of us, with 4 glasses of wine and 1 beer and all that food, it came out to just over 10,000 yen (about US$100). We're not sure if we would go back regularly, maybe for a special occasion. Over the 3-day weekend, we went to check out the Fall foliage. Saturday was the only day that was forecasted to be sunny. Only problem was that Satoshi had his German class in the afternoon. 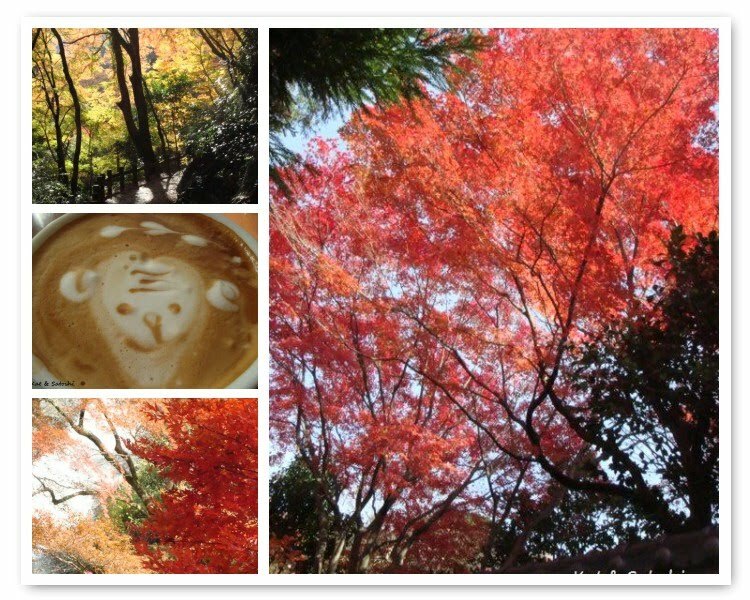 We got up early and went to Minoo Park to see the Fall Foliage at Saikoji. 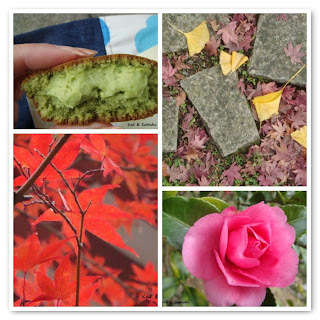 Some of the leaves had turned reddish, but for the most part, I think it needs another week. We thought about going all the way in to see the foliage near the falls, but realized we didn't have too much time, plus in recent years, the foliage near the falls have been quite disappointing, not red like most photos advertise. Sunday was forecasted as cloudy, but when we awoke, it was sunny, so I brewed some coffee, and threw some koto-man into a bag and we caught the bus to Kyuanji. We arrived there earlier than the opening time, so we had our koto-man and coffee on a stone wall outside. The flavors had changed since the last time I went, so this time we had yuzu (citron), tsukune imo (a type of Chinese yam), matcha cream (kind of like matcha buttercream), roasted sweet potato and kuri azuki (chestnut with adzuki--They were giving out flyers and on it had a coupon for a free koto-man). The sun stayed out less than half an hour and then for the rest of the day it was overcast and kind of cold. Since we were already out, we decided to check out Tada Shrine in Kawanishi. 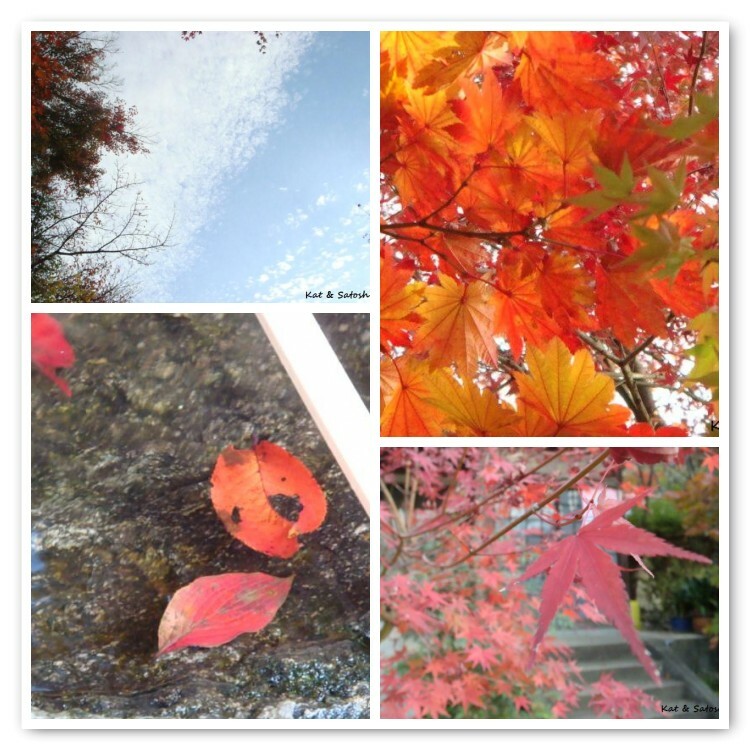 The leaves here weren't too red either, but we were glad to be able to get out and about. Monday started out really cloudy and overcast, so we decided to just stay at home. Wouldn't you know that after making that decision, the sun decided to peek its head out for the rest of the day? The weather over the long weekend wasn't too cooperative, hopefully we'll be able to experience more foliage next weekend. Do you change your dishes/tableware along with the seasons? In Hawaii, we don't really have seasons, so I've never grown up with doing this. On the other hand, my MIL changes her dishes/tableware with the seasons. "Cool" dishes used mostly in Summer are clear, white and/or blue (like ice). "Warm" dishes used mostly during the Winter are brown, green and earthy looking. Of course, there are decoration type dishes too, with sakura (cherry blossoms), momiji (fall foliage) or fruits to match the seasons. There is a vendor that comes to our shopping arcade several times a year. He mainly sells Arita-yaki and Mino-yaki (Two types of popular Japanese ceramics. Most areas around Japan have their own type of ceramics). From what I've seen, I think Arita-yaki uses brighter colors like yellow, some reds and Mino-yaki uses mainly blue and white. While you would expect his prices to be expensive, he actually sells his wares very reasonably, most under 300 yen (about US$3). I kind of overheard him talking with another customer and I think he takes defects or discontinued items off of department stores' hands then sells them, which is why he can sell them so reasonably. Did you know that the Japanese got their blue and white technique from Delft? Anyway, most of my dishes are blue and white, since they are my favorite colors, so I don't have many "warm" dishes, but I've put away my clear glass dishes for now. 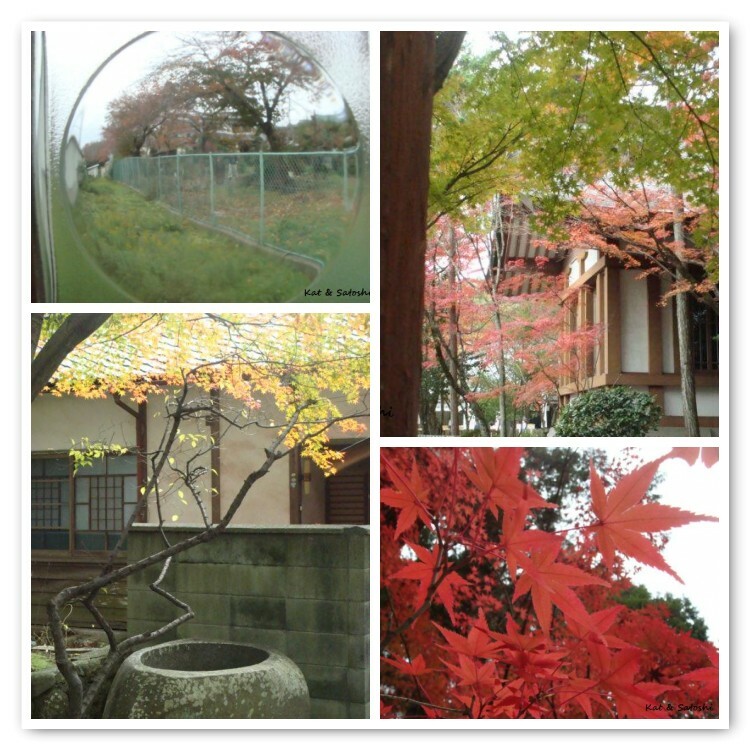 I first met artist, Kanransai at Toji Temple in Kyoto last year. His paintings and artwork are mostly of Jizo-son and Kannon, as well as enlightened figures in Buddhism. If I am not mistaken, Jizo-son watches over children and the living and Kannon represents peace. While at Toji Temple, we looked at his exhibit, some of his paintings were powerful and some were very calming. I bought a calendar of sorts at the exhibit. There are no months, just days of the month on it. Everyday, there is a "new saying", well, after going through the calendar for the whole year, you come to memorize the sayings. I like this calendar because it reminds you of something to be thankful for everyday. For example, the 31st is "Arigatoo wasurenaide arigatoo" (Thanks don't forget, thanks). The 6th is "Shizen no megumi arigatoo" (Thanks for the blessing of Nature). The 25th is "Watashi no inochi arigatoo" (Thanks for my life). And the 12th is "Itadakimasu, Gochisoosama, Arigatoo" (Thanks for the meal) to just name a few. 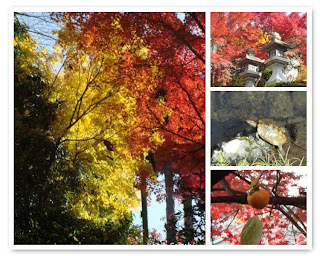 Today is Kinro Kansha no hi, kind of like Labor Day and Thanksgiving blended together, a national holiday. My grandma says that she says "thanks" everyday, no matter what kind of day she has had. Something I would like to try to do. I think this calendar helps. It will be Thanksgiving in the States soon. It is this time of year that I miss being with family and friends the most. I am thankful that we have both been healthy this year. And that Satoshi has been busy with work. I am also thankful that Satoshi lets me visit Hawaii at least once a year and that he lets me do as I wish. I was in Ikeda recently and stopped at the Chikujian counter located near the ticket machines. Chikujian is a Kyoto sweets shop whose main shop is in Arashiyama. They had an interesting looking sweet called kaki daifuku, a soft mochi wrapped around persimmon puree and sweet white bean paste. It looked just like a persimmon, and even had a dried stem on top to make it look realistic. It tasted a little sweeter than the actual fruit, but it was delicious. I also got a kuri daifuku, this is sweet azuki bean paste with a chestnut in the middle. Both were 189 yen each (about US$1.89) and a nice afternoon snack. One morning, I was watching a program and they mentioned that the "trend" nabe (hot pot) this season was tomato. Awhile back it was tonyu (soy milk) and then it was curry, but this year it is tomato. The way they cooked the hot pot on the program was closer to an Italian based soup with cheese topping the dish. I on the other hand, envisioned the tomato miso ramen at Hanamichi that I like. Put carrot, sweet potato, pumpkin, gobo and shiitake into a pot. Add consomme cube, miso and cook another 10 minutes. After consomme and miso melt, add can of chopped tomato. Add lettuce and green onion. NOTES: This was good, I think I could have added a little more miso to make it closer to the ramen flavor, but on a chilly night, this really hit the spot. It is a 3-day weekend here, hope you have a nice weekend. p.s. I'm sending this to Deb @ Kahakai Kitchen for her Souper Sundays, you should check this event out, there are many fabulous ideas for soups, salads and sammies! Tuesday, I started French language classes again. My teacher was on maternity leave during the summer so she had a substitute come in, then I went to Hawaii during the summer, and went back to Hawaii in October, so I am starting mid-way through the Fall session. No worries though, our classes don't cover a lot of information all at once, just a little at a time, so I don't think I missed TOO much. I still have problems with pronounciation, but I am slowly beginning to be able to read and figure out what is being said. After class, I had lunch at Daimaru Department store, they have a cafe called Galleria. I love their cappuccino. Up until Tuesday, there would be a heart or leaf pattern on the cappuccino, I was pleasantly surprised to see this...a little chick! After lunch I went to check out the Italian Fair at Hankyu Department store. They recently merged with Hanshin Department store, so I wondered what kinds of things they would have at their fair. Competition for business is always quite intense between department stores, so they had several different Italian chocolatiers. I also got some Majani chocolates, a Bologna chocolatier....126 yen each (about US$1.26) Apparently these chocolates were made when Fiat produced their Tipo 4. Besides their Fiat chocolates, they also had these cute car shaped chocolates--cinquino (dark blue foil--dark chocolate outside with dark chocolate ganache inside), gippino (red foil--hazelnut ganache/milk chocolate outside), furgoncino (green foil--pistachio ganache/milk chocolate). My favorite was the cinquino. Do you know what T.M.I. stands for? I didn't until a couple of years ago. It means "too much information". Well, the empty lot in front of our building has sold and started to build a house and as I walked past, I noticed that they had a porta-potty, but not the kind with walls. The weather has been quite gloomy the past couple of days. Cold and rainy, sometimes kind of blustery. Since it is getting colder, I've been trying to find ways to put veggies into our meals without having to have "cold" salads. We had vegetable soup for a couple of days with crusty baguette. On the day we were finishing up the soup, I also made this side dish with ham, fresh shiitake and spinach. The seasoning is a couple of squirts of tonkatsu sauce and a pat of butter. Super easy and really delicious. The original recipe uses only shiitake, tonkatsu sauce and butter, but I had leftover ham and spinach that I wanted to use, so I threw that in. It came out just as delicious, though I would probably not use ham the next time, just veggies. Dinner last night was sauteed pork wrapped pumpkin. This was my first time trying this recipe, but it was easy and fast. Sauteed Pork Wrapped Pumpkin Serves 2 adapted from Orange Page's "Aki ni Oishii Kondate"
NOTES: The pumpkin slices I had were longer than the meat I had, so I cut the pumpkin slice in half and wrapped each piece with pork. I liked this, though it may be a bit sweet for others with the combination of the pumpkin and the sauce, you may want to cut back the sugar in the sauce if you don't like things too sweet. Since the pan I used doesn't allow heat higher than medium (non-stick), I cooked it on medium until there was just a little liquid left. How is the weather where you are? What have you been eating for dinner? Here is the hikidemono that Satoshi received. Since the bride grew up in Kyoto, the items were from there. A handmade chazutsu (tea container). The copper tea container is made by Japan's oldest craftsman, Kaikado which has been in business since the 8th year of Meiji (1875), very nice. This shop also makes silver, tin and brass tea containers. He also received a hand-screened tenugui. Tenugui is usually made of cotton and is a thin cloth used as a hand/face towel or sometimes tied as a bandanna. I've even seen people frame them and hang them in their homes or use them as runners on their tables. A baum kuchen by a well known sweets shop in Kyoto called Malebranche. They have counters at most department stores and I often buy from this shop to give away as gifts. Satoshi said they had Japanese-French food and that the reception was held on a large property that was renovated near Kodaiji. 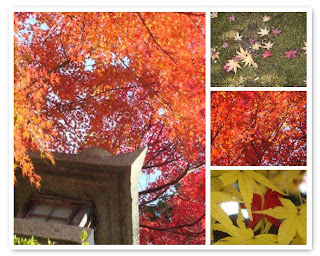 With Autumn's fall foliage here and there, there were many tourists eager to see the leaves lit up.